Pędzimy dalej w kierunku budynku Parlamentu Europejskiego. Nasi gospodarze prowadzą nas malowniczymi nadbrzeżami Renu. Droga wydłuża się znacznie, a czasu coraz mniej. Zamiast rundy honorowej zrobił się kolejny dzień biegu. W punkcie kontroli bezpieczeństwa Parlamentu Europejskiego meldujemy się punkt 16.00. Dzięki decyzji dyrektora Europarlamentu p. Klausa Welle, jako biegacze mamy zapewnioną tzw. „szybką ścieżkę“. Nie musimy nawet pokazywać dowodów osobistych, które wszyscy, na wszelki wypadek, mamy w spodenkach. Jeden kilometr „kosztuje” 100 Euro. Można się składać lub kupować część. Dla tych którzy kupią cały kilometr lub kilka, przewidziana jest specjalna nagroda- można sobie wybrać nr swojego kilometra. Część jest zajęta- widać to na www.freedomcharityrun.org. It became 12 km instead of 6! But first things first. Hans- Juergen Lubberger, who has PhD in chemistry and simultaneously is specialist in crisis management together with collegeague from LC Kehl, Daniel took care of us since the early morning. 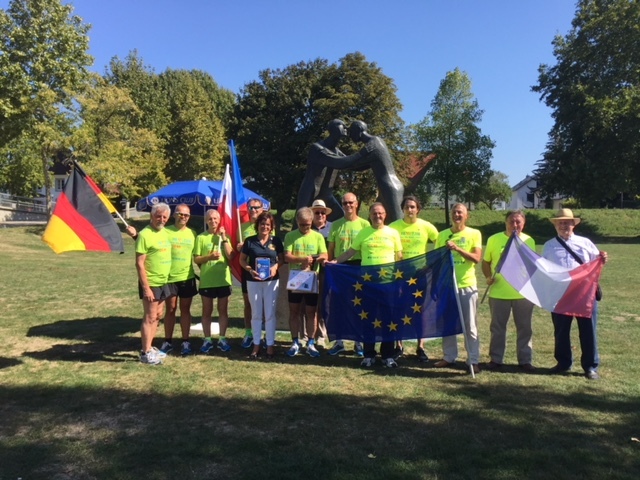 It took great effort to bring our car to finishing line in Strasbourg and return to Kehl at 1 PM. City road is almost utterly under construction, hence giantic traffic. At 1 PM near Mimron bridge, under „Begegnung“ statue which symbolise concilation showed up Toni Vetrano, mayor of Kehl. Few minutes earlier we greet Frank Siegmund, Past Governor of district 111 OM from Germany. Our splendid host from Pilzen, Vice Governor Cestmir Kazelucha also appeared there. At excatly 1.30 PM we received information that from French side of the bridge, group of French Lions are coming in our direction. They are governors from severeal French districts leaded by Strasbourg Governor Olivier Meazza and past Governor Jean – Paul Feldman. We have started by running through the bridge and we said farewell to that hospitable country. At the top of the bridge, group of 100 people appeared, among them World President of Lions Clubs Gudrun Yngvadottir. After kind welcoming we chanted together We Run We Serve! 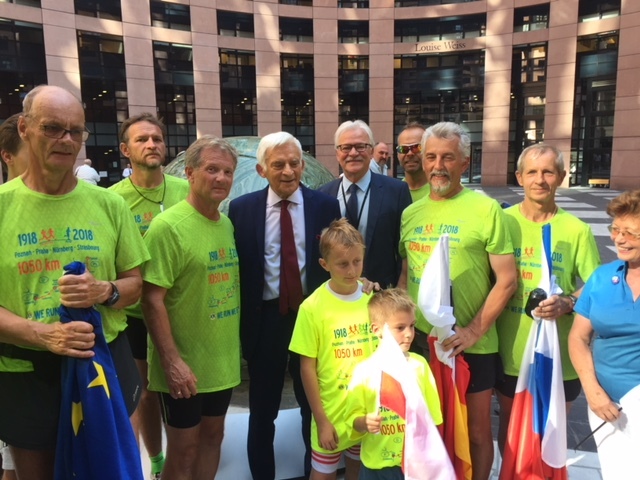 We started with about 30 runners, all of them dressed in fluorescent t-shirts, in direction of Strasbourg’s mayor, Ronald Ries. Hot weather. After 6 km, quarter before 3 PM we reached it exhausted. Instead of speech and greetings, we are looking for water! When we stopped being thirsty we were ready for the official part. We went like the wind to European Parliament. Our hosts led us through picturesque countryside of Ren. Distance was further than it supposed to be and time was running up. Instead of lap of honor we have another day of running. We were at safety point in European Parliament at 4 PM. We did that swiftly thanks to director Klaus Welle. We did not even show our ID cards, which we had with us just in case. Without any formalities we ran into so called „Agora” inside modern building of European Parliament. We were surrounded by hundreds of people, among them former Prime Minister Jerzy Buzek, member of European Parliament Tadeusz Zwiefka and leader of German CDU delegation Daniel Caspary. They greeted us on behalf of whole European Parliament. There were also representatives of all fractions. Immense number of cameras recorded our last metres. Dariusz Sokołowski from TVN interviewed us, next he invited IP Gudrun Yngvadottir. Prime Minister Buzek congratulated our initiative which combine Europe. He said about importance of Poland and Europe in European Union and that we should all support it. Freedom Charity Run is doing it for years, this time on 1000 km route. In the evening we were guests of Governor 113 French District, Oliver Meazza. Among 160 people, there were many Governors from France, Germany (including our good friend PDG Frank Siegmund from 111 District OM). There were representatives from Sweden, Switzerland, USA, Canada and Lebanon (including PID Salim Moussan who arrived specially for that occasion). There was also presentour recent host from Pilzen, VDG Cestmir Kozelucha. Governer Eva Hełka came specially from Poland with her husband, son-in-law and grandchildren. Son-in-law and both grandchildren ran with us from Kehl to Strasbourg. Our team was asked to speak and we had standing ovation on the stage. We had never such great finale like that one. Many districts declared financial support to our charity purpose. Olivier Meazza and Jean Paul Felmann, our great partners gave us check form 1 900 EUR – it is half of our income from that day. The other half is dedicated for LCIF (Lions Clubs International Fund). Few minutes past 11 PM, happy and „a little“ exhausted we came back to hotel. We are extremely glad for either proceeding of the run and its outstanding ending. We will gather more funds untill next year. It is certain that we help again to children from Syria but it is unsure whether we will be able to help in Matilda’s surgery. We have ran for many unimaginably long distance. We were almost 2 weeks outside our homes. It is all to emphasize social purposes and charity of the run. Rest of it is in hands of our friends, supporters etc. Please help. 1 km costs 100 EUR. You can buy more than that or less. For those who will buy 1 km or more there will be special reward – you can choose number of the kilometer. Some of it has been already taken, you can check at www.freedomcharityrun.org.